Finally !! After 2 years waiting for the planning permission, we finally have our pool ! As the property is on an archeological site with 2 bronze age monuments, any excavation for building is not allowed. This is why we were required to install an “above ground” pool. The pool is equipped with a salt electrolysis system. The advantage of that system is that whilst the salt content is less than a teardrop, it works as a comprehensive cleaner and disinfectant. No need for 5 different chemicals that would be harmful to your body and the environment. Instead, your eyes remain clear, your skin and hair soft and you can water your plants at the end of the season with it too ! 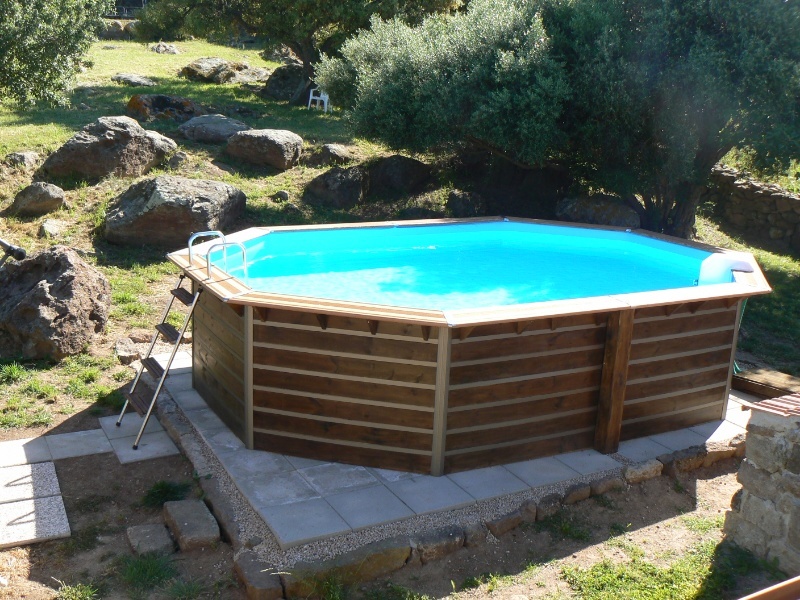 The pool is an octogonal shape and measures 5m30 x 3m70 x 1m30. In terms of security features for children, it is above ground and accessible from a removable ladder. We have also installed a gate with a latch and combination lock making the whole rear garden area inaccessible to young children. The pool depth is 1m30 throughout. above ground pool with salt electrolysis system. Great on your skin and the environment. And it is ready for our 1st guests in May 2014. Let the season begin ! !